Victoria, Mahe (Seychelles) – November 20, 2018 (travelindex.com) – People in the tourism and travel are conscious that it is in public / private sector partnership that success will be guaranteed. This is also by working together in the region, on the continent and globally. 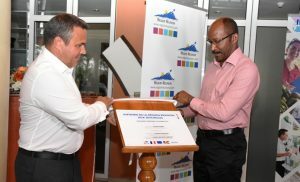 This last week Pascal Viroleau, the CEO of the Indian Ocean Vanilla Islands was in Seychelles for discussions with the island’s Minister responsible for Tourism, Mr Didier Dogley and his Team. The meeting was primarily to discuss the regional Organisation which should see the Seychelles Minister take over its Presidency in December. The rotation of President for the Indian Ocean Vanilla Islands is enshrined in the documents that established the organisation and ensures that each Member State or Island gets their chance to lead their tourism organisation. The Vanilla Islands has achieved remarkable success since its formation. Today the success in what is called Cruise Tourism for the Indian Ocean stand out with increased in rotations, and with the arrival of new companies to ply in the Indian Ocean. The support for the Organisation by Reunion Island has helped ensure the success of the Regional Body. President Didier Robert, the President of the Regional Council of Reunion has been a fervent supporter of working together so much so that he has even opened Reunion Trade Offices in most of the Indian Ocean Islands in a bid to encourage more trade and visits between the sister islands of the Indian Ocean. Working together for the success of Tourism is important in all its facets. The Continent of Africa knows that tourism is the industry that can help the ordinary small African to be part of the continent’s business performers. African is receiving just over 5% of the world tourism movements and this will remain so unless Africa claims back its industry and works together as one. Seychelles International Airport is set to see the opening of a new CIP Lounge as from the 1st. December. “We can today confirm the official opening of our PAYANKE CIP Lounge on the 1st December” said a representative of the new CIP Lounge. Family events bring joy as it rallies the family even closer together. In the past week two family events did us proud and brought us together. My brother Marston’s wedding to Laura Savy, and my daughter Michelle was admitted to the Seychelles Bar. Marston St.Ange of Chez Marston Guest House on La Digue was married last week to his long time partner Laura Savy. The wedding ceremony was held right on the beach of the lovely Anse Severe in the presence of the couple’s two daughters Sophie and Lucie and many members of both families and also close friends. Marston and Laura own and manage the Chez Marston tourism establishment and the adjacent Orchid Small Hotel. Michelle St.Ange-Ebrahim has been called to the Seychelles Bar during a ceremony at the Seychelles Supreme Court chaired by the island’s Chief Justice Mathilda Towmey. Michelle was presented by her pupil Master Kieran Shah in the presence of David Esparon, the Deputy Attorney General of Seychelles who was also her pupil master during her years at the Attorney General’s Office. Former President James Michel has called on Ocean Industry leadership from across the globe to support a call for large parts of the high seas which remains unregulated at the moment to be declared fully protected areas to be respected by all countries and ocean users. This he says will ensure that ecosystems and resources of the high seas remain in good shape for the benefit of generations to come. Mr. Michel made the call in an address to ocean industry leaders at a dinner organised by the World Ocean Council on the first day of the 6th Sustainable Ocean Summit in Hong Kong on Wednesday. The world needs a new breed of innovative entrepreneurs to tap into the vast potentials that the oceans present, who will be profitable but at the same time ensure that their own activities and that of their partners and suppliers are sustainable. He recommended that maritime transportation technology engineers be pushed to the limit to develop carbon efficient vessels and also explore the possibility of making use of renewable energy sources to power vessels. Mr. Michel also called for the use of Fish Attracting Devices (FAD) be discontinued or banned as they are indiscriminate of the species and sizes of seafood they attract, and which are eventually caught up in the nets. “The fishing industry can tap into technological advances in satellite and other communications platforms instead which are enabling the development of systematic observations in the deep oceans and even under the ice” he advises. With regards to plastic pollution he encouraged the business community to support the establishment of waste treatment facilities as well as clean –up operations, especially on islands and coastal areas with the aim of limiting the amount of plastics and waste from making it to the ocean. In addition he proposed that the United Nations consider the WOC as an official partner of its agencies involved with regulating the oceans so as to create synergies between the UN and all maritime stakeholders. At small islands states level Mr. Michel proposed some ideas for practical steps that will mark progress. They include a one stop global shop window for good ideas and practical projects that will further the cause of the Blue Economy, encourage small islands to develop centres for excellence for one specific activity (like Seychelles can be the home of progressive Blue Economy management schemes, Samoa for waste management and Cape Verde for tidal energy solutions), bring more women into the maritime workforce and encourage new ideas for sustainable development, an annual award by the UN for the greatest contributions to the sustainable use of our shared ocean and the creation of a focussed business leadership group, concentrating on the Blue Economy in small islands states. Mr, Michel was addressing the Summit at the invitation of the Founder and Chief Executive Officer of the World Ocean Council, Mr. Paul Holthus. This year’s edition under the theme “Ocean Sustainable Development: Connecting Asia and the World” has attracted a large number of global ocean business industry leaders, inter and non-governmental organisations the science community and academics. The Seychelles Petroleum Company SEYPEC was also being represented by its Legal and Corporate Officer, Alvine Marie. The James Michel Foundation was also being represented by the Vice Chair, Professor Denis Hardy and Acting Chief Executive Officer, Antoine Onezime.